Thanks Phil for the excelent hanger. I bought one in Ventura. It's really strong, not flimsy like regular hangers. I just scoop up my wetsuit after taking it off. Very cool!!! Amanda C.
The slide hanger is simple, sturdy, well designed and unique. Made from recycled plastics and paper, always a plus in my book. Wet fullsuits can get heavy and an improper standard hanger will stretch out your shoulder panels. 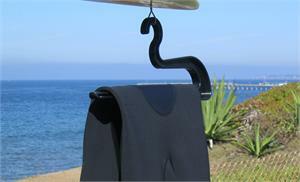 The Slide hanger offers a no stress, well balanced solution to drying/storing your wetsuits. No more shoulder horns! A new product that actually lives up to its claims.